"Keep Your Medicines Organized & Easy to Reach"
Keep your cabinets organized and your important prescription and vitamin bottles easily accessible. 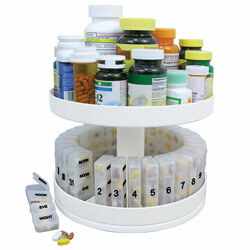 With two revolving shelves and 31 pill compartments that help you lay out daily doses for an entire month, the Revolving Medicine Center gives you quick, easy access to pills. You'll never forget to take your meds again!